EVERYONE CAN BENEFIT FROM A BETTER NIGHT’S SLEEP! Regardless of whether or not you are a competitive athlete, you will benefit from a better sleep pattern. Many environmental as well as physical factors contribute to poor sleep from time to time. No matter what your athletic goals are, ProteinCo Canada’s ZMA will improve recovery, lift your mood and help you maintain a healthy body weight. Gain Weight – Aligning all the stars that improve workout results When your goal is to increase muscle mass and overall body weight, training and recovery must align properly. While training must be done in a graduated and methodical manner, recovering from those efforts is what makes you stronger and faster. If you don’t recover properly before your next training session, your results will stagnate at some point, possibly even going backwards. Gaining weight for sport specific purposes requires precise nutrition, training, and recovery programs. Our ZMA is a key to the recovery process. Done properly, you will build maximum amounts of muscle mass and gain the overall body weight you are looking for. Lean Muscle – Promoting HGH release which is key to protein synthesis The biggest release of HGH your body promotes each day is when you are asleep at night. Having that sleep interrupted or sporadic can cause significant decreases in HGH production. Since you only produce about a teaspoon each day, even a small decrease can be very detrimental to your lean muscle development. By improving serotonin production, you sleep better thus giving your body the best chance of being most efficient at this and other processes overnight. Fitness – Supplementing your fitness goals, regardless of what they are When we say fitness, we believe that means you are lean and healthy from regular exercise and sensible eating habits. Most everyone desires to have a lean and toned looking body or gym memberships wouldn’t be what they are. Simply trying to keep up with your kids can be a fitness competition of it’s own. Carry a serving or two of ProteinCo Canada’s Whey Protein Blend in a water bottle as backup food whenever you need it for the entire family. Lose Fat– Making sure you have adequate Vitamin B6 levels Pyridoxine HCL is the vitamin most important for fat metabolism in our ZMA formula. As well, it’s responsible for proper metabolism of fat and protein. This becomes a complex process that ultimately results in better fat metabolism and reduced body fat. Especially if you consume alcohol, this key vitamin will assist you with maintain fat burning levels that are conducive to overall body fat loss. Active Lifestyle – Better rest and recovery from everyday life Possibly more strenuous than athletic training is the normal daily routine for many of us. Stresses of daily life can be particularly destructive for those looking to lead a healthy lifestyle. ProteinCo Canada’s ZMA can help you sleep better giving you more energy for whatever your day throws at you. ProteinCo Canada’s ZMA is a recovery and better sleep supplement. Formulated with Zinc, Magnesium, Vitamin B6 Plus 5-HTP to provide superior performance over other ZMA supplements Canada on the market. All the ingredients work synergistically to help you sleep better and get more REM sleep, thus promoting growth hormone release and protein synthesis. This is accomplished through increase serotonin production. One of serotonin’s many properties is the regulation of your sleep, mood and appetite. All three of these are critical to proper recovery making our ZMA supplement a must have for nearly everyone. BLENDED MINERALS PLUS 5-HTP FOR SUPERIOR RECOVERY! Why our formula leaves the competition in the dust Our ZMA formula is a unique combination of zinc and magnesium that are quickly assimilated. The salt derivatives of Zinc and Magnesium provide fast and complete absorption. You may find other ZMA formula with similar ingredients but the brilliance is in the details. Additionally, being associated with over 300 human enzyme processes, these minerals promote protein synthesis and hormone production to name two. This means massive muscle growth through enhanced natural processes in your body. Vitamin B6 as Pyridoxine HCL Crucial to the process of supporting muscle recovery is Vitamin B6. Pyridoxine HCL is the most readily available form of B6. It’s involved in the glutamic acid transformation to natural GABA, which is the acid that supports recovery of your muscles. In addition, pyridoxine HCL is very important for metabolizing fat, carbohydrates and protein in your body. Most likely, these benefits are all due to increased GABA levels. Studies indicate levels in the brain can increase HGH growth hormone production. Doing this naturally is the safest in the long run for your overall health. Taking GABA supplements isn’t recommended by ProteinCo Canada. Adequate amounts of vitamin B6 should give you all the improved muscle development you need without possible side effects of taking GABA directly. Magnesium and Zinc Again, it’s not just the magnesium and zinc that are important; it’s the types and quantities that make a difference. Compare the quantities in our ZMA with competitor brands. You will notice higher amounts of both magnesium and zinc in most if not all of them. From our research, we have formulated our product with proper amounts of all nutrients and no more. This means added value since we don’t have to charge you for excess nutrient content that has little or no additional value. Our formulas are thoroughly researched and purposeful, not just a copy of someone else’s ingredient content. 5-HTP ProteinCo Canada’s ZMA supplement is enriched with 5-HTP. This naturally occurring amino acid is a precursor to serotonin. The result is added recovery benefits by regulation of your mood, appetite and sleep. All of these contribute to improved recovery, or lack thereof. 5-HTP takes our ZMA from great to outstanding! SLEEP BETTER SO YOU RECOVER FASTER! The power in our formulation is how it works naturally to improve your sleep. There are a host of processes your body goes through when you sleep soundly and uninterrupted through the night. ProteinCo Canada’s ZMA not only enhances serotonin release for this purpose, it works to build better overall sleep patterns. As we like to say, “never underestimate the healing power of sleep”. Numerous daily stresses and extraordinary fatigue for training and competing can all contribute to restless sleep patterns. The addition of 5-HTP in our ZMA formula works naturally to improve your recovery, making sure you get the best night’s sleep possible. Q – Not many ZMA supplements have 5-HTP. Why is that? A – To be honest, we don’t know why they wouldn’t include this key nutrient in this supplement. It plays a key role in the synergistic way these nutrients are utilized in your body. We add 5-HTP purposely and for good reason. Q – What foods contain calcium that I shouldn’t consume as the label states? A – Popular belief would have you thinking that milk is high in calcium so that is something to avoid. The reality is calcium in milk is poorly absorbed so it shouldn’t inhibit zinc absorption too much. Regardless, we recommend avoiding milk to chase down your ZMA. Raw vegetables are a better source of calcium, but rarely do people consume them right before bed. Just remember to avoid eating or drinking anything other than water 3 hours before you go to sleep as this will improve the benefits you get with this supplement. MAGNESIUM, ZINC, B6 AND 5-HTP FOR SUPERIOR SUPPLEMENT POWER! Q – Do men and women use the same serving size? A – We recommend women take 2 capsules and men 3 capsules 30-60 minutes before bed. If you are a larger female or train very hard, or a smaller male, this suggestion could be swapped. Everyone is different so use our suggestion and then adjust as necessary to match your needs precisely. Not recommended for women who are pregnant or nursing or anyone taking prescription medications. 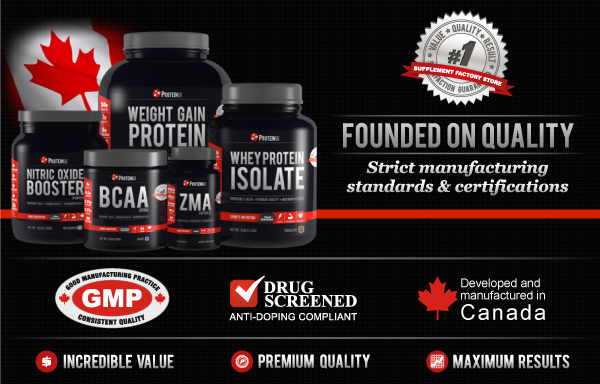 Premium Quality - Strict manufacturing standards and certifications As with all ProteinCo Canada supplements , ZMA is manufactured under strict cGMP procedures to ensure the quality you deserve. This translates to peace of mind for you no matter what your reason is for wanting pure, healthy supplements. Maximum Results - Formulated from extensive research and development! Take a look at other ZMA supplements on the market and you will notice many of them have the same ingredient quantity. We don’t trust that other manufacturers formulate their products in concert with top scientists. Anyone can throw a particular amount of popular ingredients in a capsule and call it a quality supplement. Our research proved we only needed the ingredient amounts listed in ZMA to be effective. More isn’t always better. By studying the scientific results of our research, we are able to provide better value in all the supplements we manufacture. This equates to superior results coupled with unequaled quality, purity, and value. NIGHT Nutrition As this is a “help me sleep” supplement, there isn’t another time of day it should be taken. Consume on an empty stomach an hour or so before bedtime. If you are on a night shift work schedule, taking ZMA 30-60 minutes before going to sleep may assist with a daytime sleep pattern as well.